Well, it seems that Saturday, May 21st is Judgment Day, so please come and judge for yourself , the work of 30 printmakers exploring the extremes of size, intimacy and environment at a reception from 6:00 to 9:00 at the Meridian Gallery on 535 Powell Street. 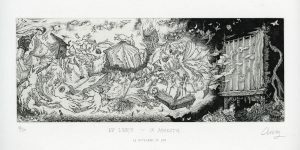 I will be showing several recent etchings, including a just finished piece, “A Ticket to Ride”, that is loosely based on Albrecht Durer’s “The Knight, Death and Devil”. In addition, I will be creating an intimate environment in which to present the work that will involve not only some of the very smallest pieces in the show, but also the largest, in the form of a single piece of silkscreened wallpaper (108 sq. ft.!) created and printed with the help of Art Hazelwood. 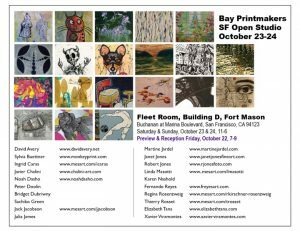 I will be showing with the Bay Printmakers this year for Open Studios, during the weekend of Oct. 23-24 from 11:00 until 6:00 both days. 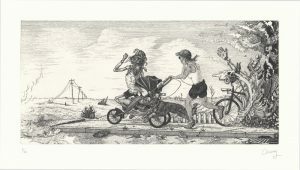 The Bay Printmakers comprises of 20 artists who explore different facets of printmaking, and will be showing in the Fleet Room in Building D at the Ft. Mason Center, Buchanan and Marina Boulevard. There will also be a preview and reception on Friday, Oct. 22 from 7:00 intil 9:00. 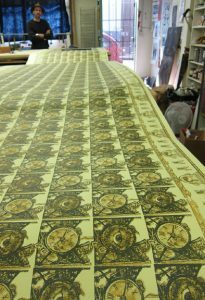 On view will be, hot off the press, my most recent effort, The Ticker, in addition to my many other etchings. I look forward to seeing you there and hope that you will enjoy veiwing work by this diverse group of printmakers. Also: If you happen to be in Los Angeles this weekend (Oct. 16th and 17th), I will be showing at the Beverly Hills Affaire in the Garden at booth #134. See www.beverlyhills.org/artshow for more information. My work was judged Best in Show last May. 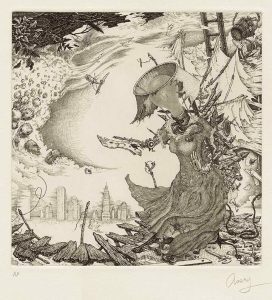 David Avery’s most recently completed print, Tempestuous Muse, was selected for a purchase award by juror Peter Frank at the 23rd McNeese National Works on Paper exhibiton in Louisiana this April.